High Quality Content by WIKIPEDIA articles! 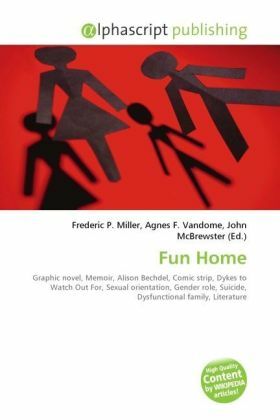 Fun Home (subtitled A Family Tragicomic) is a graphic memoir by Alison Bechdel, author of the comic strip Dykes to Watch Out For. It chronicles the author's childhood and youth in rural Pennsylvania, USA, focusing on her complex relationship with her father. The book addresses themes of sexual orientation, gender roles, suicide, dysfunctional family life, and the role of literature in understanding oneself and one's family. Writing and illustrating Fun Home took seven years, in part because of Bechdel's laborious artistic process, which includes photographing herself in poses for each human figure. Fun Home has been both a popular and critical success, and spent two weeks on the New York Times Best Seller list. In The New York Times Sunday Book Review, Sean Wilsey called it "a pioneering work, pushing two genres (comics and memoir) in multiple new directions."